GettySadiq Khan at the UK Tech 100 party. London Mayor Sadiq Khan wants big tech firms to work with politicians to end hate speech and election meddling. 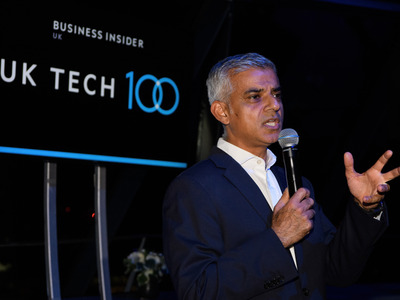 Speaking at Business Insider’s UK Tech 100 party, he said collaboration will be critical to putting things right, rather than snuffing out innovation with regulation. It looks increasingly likely that Britain is going to introduce new regulations for Silicon Valley’s behemoths. The mayor wants London to be the tech capital of the world. London Mayor Sadiq Khan has called on tech companies like Facebook and Twitter to work with lawmakers to put right some of their missteps in recent years. Speaking at Business Insider’s UK Tech 100 party on Thursday night, Khan said there are “challenges facing the digital sector” and that collaboration, rather than heavy-handed regulation, will be needed to put things right. “It is a reality that we have seen elections influenced by technology. It is a reality that we’ve seen people radicalised by technology. It is a reality we’ve seen the promotion of hatred, particularly against women and minorities,” he told a room full of British tech talent at the top of The Gherkin in London. Khan, who featured at number 40 on the UK Tech 100 ranking, was speaking at a time when it looks increasingly likely that Britain will introduce new regulations for Silicon Valley’s behemoths. Influential Conservative MP Damian Collins, who also features on the Tech 100 list, told Business Insider that regulation is coming, with firms like Facebook set to be held to higher standards on things like illegal hate speech. Khan added that he wants to make London the tech capital of the world. “London is the tech capital of Europe and my mission is for us to be the tech capital of the world. Not just because I’m competitive, but because I can see a difference tech makes to reshaping our society, reshaping our economy, and reshaping our culture,” he said.